Home » Merrick LID Can Dog Food Chicken 12.7 oz. 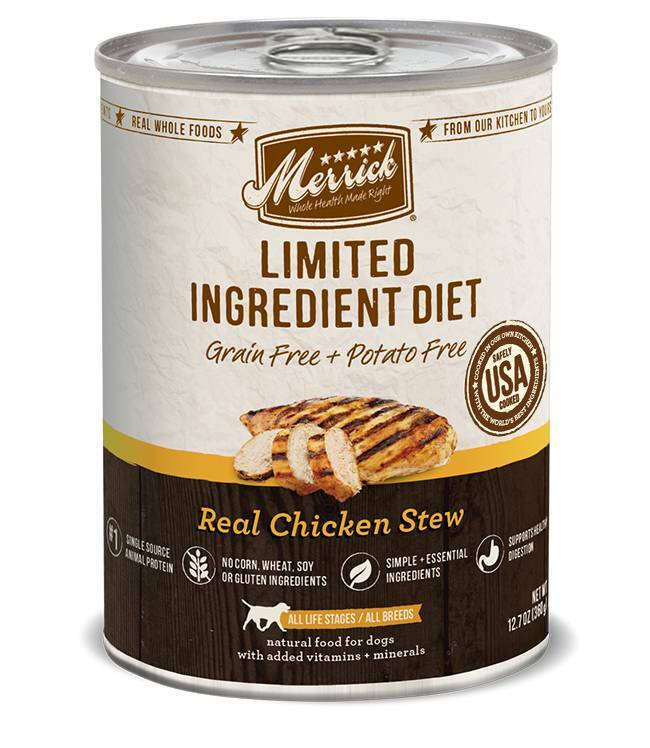 Merrick LID Can Dog Food Chicken 12.7 oz. Merrick Limited Ingredient Diet recipes support healthy digestion with a single source of animal protein; real deboned meat, poultry or fish as the first ingredient provides important amino acids, vitamins & minerals. Recipes contain none of the grains, corn or soy or gluten ingredients pets can be sensitive to, and are made with the simplest & most essential ingredients – with no artificial colors, flavors and preservatives. And, like all Merrick recipes, Merrick Limited Ingredient Diet recipes are safely cooked in the USA in our own kitchen with the world’s best ingredients, with no ingredients from China, and deliver the quality, nutrition and taste sensitive pets deserve. Deboned Chicken, Chicken Broth, Chicken Liver, Natural Flavor, Dried Peas, Pea Protein, Dried Citrus Pulp, Calcium Lactate, Canola Oil, Sodium Phosphate, Salt, Choline Chloride, Minerals (Zinc Amino Acid Complex, Iron Amino Acid Complex, Manganese Amino Acid Complex, Copper Amino Acid Complex, Potassium Iodate, Cobalt Glucoheptonate, Sodium Selenite), Vitamins (Vitamin E Supplement, Vitamin B12 Supplement, d-Calcium Pantothenate, Vitamin A Supplement, Niacin, Vitamin D3 Supplement, Riboflavin Supplement, Folic Acid, Pyridoxine Hydrochloride, Biotin, Thiamine Mononitrate), Xanthan Gum, Gum Ghatti, Potassium Chloride, Calcium Carbonate, Guar Gum, Caramel Color.